In my opinion, this succinct description of the possible middlegames is outstanding, and may help the player a lot when studying chess games. The problems everybody has to face when studying annotated games are clear: if the game is annotated by a professional player in active, do not expect great revelations… If the game is annotated by journalists everything will depend on their ability for annotating games, space provided by the editor, time little they have to devote to the matter, etc. (I have compared notes provided by world-class GMs to the same games and the result is -to say the least- worth thinking about… If the notes are written using a computer and providing variations only, they will lack any strategical or positional guideline, and so on. My advice: try to do your own notes, try to see positional plans and strategical ideas. Concerning the above classification, the first idea is to try to attach names to the different parts, because it is not a matter to describe middlegame possibilities, the classification also identifies styles of playing Chess. It is true every top player masters the different ways of dealing with middlegame positions, but certain middlegames tend to appear out of the same type of openings, and one´s opening repertoire has a lot to do with one’s approach to Chess and ,ultimately, with one’s style. I guess many people would associate “intuitive positions” to Tal and Shirov, for example. I would put Fischer under the heading of resolvable positions (but also Tal, Spassky,…), and leave a Petrosian or a Karpov for “manoeuvring positions”. Let me insist, this is but only a bit of speculative passtime, as I have explained above: Tal played beautiful positional games and Petrosian knew how to sacrifice pieces and Pawns. And I insist once again: this classification is, primarily, a classification of middlegame positions, not of chessplayers. Alexander Alexandrovich KOTOV was born in 1913 and died in 1981. He became a GM in 1950. Let me recommend you the three books mentioned above. He also wrote several other books, magazine articles and compiled the life and games of his hero Alexander Alekhine. He also wrote a book with Yudovich about the history of the Soviet Chess School, with very interesting historical facts. He was considered an attacking chessplayer and was known as a” giant killer” because he defeated the cream of the cream of his fellow GM companions. When I managed to get his book “Think Like a Grandmaster” it was like “seeing the light” or having found a secret knowledge.. I cannot remember how many times I read the book and worked following the pieces of advice it contains. 1. d4, Nf6/ 2, c4, e6/ 3, Nc3, Bb4/ 4. a3, Bxc3/ 5. bc, d5/ 6. cd, ed/ 7. Bg5, c5/ 8. f3, h6/ 9. Bxf6, Qxf6/ 10. e3, 0-0 / 11. Ne2, Re8/ 12. Kf2, Qe7/ 13. Qd2, Nd7/ 14. Nf4, Nf6/ 15. Bd3, Bd7/ 16. h3, Qd6/ 17. Rhb1, b6/ 18. Bf1, Re7/ 19. a4, Rae8/ 20. Re1, c4!/ 21. g4, g5!/ 22. Ne2, Rxe3!/ 23. Ng3, Qxg3!/ 24. Kxg3, Ne4/ White resigned. Today’s position to solve: Mate in 3 moves. Chess Training with Keres et alii . One of the books I have in my Chess library is a little-known gem written by Paul Keres. The title translated into English is “The Art of Analysis” and has 67 pages. It is devoted to help to develop the players’ skills in the art of analysing adjourned positions. Yes, you may say there are no adjourned games these days… But please remember Chess can be seen as a whole in which the sum of the parts are bigger than the whole itself, and that the great Chess trainer “guru” Dvoretsky devoted nearly an entire book to teach tactics by using the analysis of adjourned positions. So it is not today’s practical use but the benefits we can obtain in the development of our tactical and analytical skills. Nearly every Soviet trainer has strongly recommended the analysis of adjourned games as one of the best way to develop those analytical skills. The position (I have put it from the Black side of the board so Black plays upwards) was adjourned here and White sealed his 41st move. 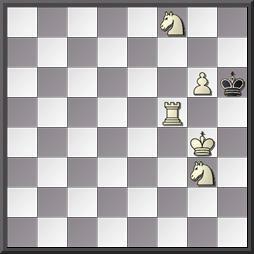 Although Keres has a Pawn about to reach the queening square, the position still has to be analysed. Remember that we are in top-level Chess, with players ready to fight and find very hidden resources. Another Soviet Chess “heavyweight” , the late A. Suetin, also devote chapters in his books to recommend these types of exercises. He said they were excellent training grounds because they imply two types of Chess thinking: one using abstract thinking (without calculation of variations) to determine which pieces to change, which to preserve, how to place ones pieces, etc. , and another tactical one because most of the positions are full of tactical variations with hidden possibilities and tricks. This is the way they worked in the “golden age” of the Soviet Chess . These were the methods they use in their Chess schools, Pioneers’ Palaces, Chess training camps. Remember that in those days, even World, ex-World Champions had to devote time to training sessions with the young promises. This game was played in Leningrad in 1930. Botvinnik managed to win after his opponent missed a drawish line on move 50th. But this was pure Chess! : a tug-of-war between two outstanding minds. In those years, Ragozin was Botvinnik’s trainer and they played scores of secret games which helped Botvinnik to become one of the best chessplayers in the history of the game. The game proceeded 38 …, Rxf3 39. b6, cb6 40. cb6 Rd8! 41. Kc4, Re3 42. Nc6, Re4 43. Nd4, f3 44. Ra2, Rc8 45. Kb4!, Re1 46. c4, Re4 47. Kc3, Re3 48. Kb4, Re4 49. Kc3, Rd8! 50. Nc6? , Re3 51. Kb4 , Re2 52. Ra1, f2 53. Nxd8 Re1 54. Ra8, f1=Q 55. Nc6, Kg7 and Black finally won the game. 41. Qd3 (sealed), Rxg6/ 42. hg6, Qd4! 43. Qe2, Kh7 44. Qd1, Qd3! 45. b3, f6! 46. gf6 , Kxh6 47. f7, Kg7 48. Kg1, Kxf7 49. Kg2 (Here Keres analyses 8 different possibilities depending where the two Kings can be placed on.He determined that all of them were winning for him) , 49…, Kg6 50. Kg1, Kh6 51. Kg2? (51. a3) , Kg5 52. Kg1, a5! 53. Kg2, a4 54. ba4 , Qe4 55. Kf1, Qxc4 56. Kg2, Qg4 / And White resigned. 41. …, Nd3 (sealed) 42. Qc8, Kg7 43. Qf5! , Qd2 44. Nd4! ,Qe1 45. Kg2, Qe3! 46. Qd5!, Qf2 47. Kh3, Qf1 48. Kg4, Nf2! 49. Kf5, Qd3 50. Ke5, Ng4 51. Kd6 Qxa3 52. Kc7, Qe7 53. Kc8, Ne3 (end of home analysis according to Keres) 54. Qb5, Qe4 55. Qb2, Kg6 56. Qb6, f6 57. Ne6 ,Nc4 58. Qa6, Ne5 59. Nc7, Qc2 60. Qd6, Qxh2 61. Nd5, Qf2 62. Kb7, Qxg3! 63. Qxf6, Kh5 64. Qe6, Ng4 65. Ne7, Qf3 66. Kc8, Kh4 67. Nf5, Kh3 68. Kd8, h5 69. Qg6, Ne5 70. Qe6, Ng4 71. Qg6, Ne5 72. Qe6 , Qd3 73. Nd4, Ng4 74. Qd5, Nf2! 75. Kc8, h4 76. Qe5, Qe4 77. Qf6, Qf4 78. Nf5, Ne4 79. Qe6 , Qg4 / and Tal resigned. I have got over 400 Chess books in several languages (English, Russian, German, Spanish, Serbocroat, Estonian, Czech, Hungarian). Many of them are devoted to strategy, tactics,planning,endgames,calculation of variations and so on. But sometimes it seems that the more you read/study the less you seem to understand about how Chess is played. (The 1978 World Chess Championship was full of tension. There were excellent games, short draws, less goods games and interesting situations. Karpov was the Soviet World Chess Champion. His opponent, V. Korchnoi had left the USSR slamming the door, and was an enemy of the state. 1.- Perhaps things are not so straightforward and methodical in the GMs Chess minds? 2.- Perhaps the only thing we can do is to study Chess letting our intuition work alone afterwards? 3.- Maybe we can extract a lot of considerations but it is impossible to describe any Ches thinking process unless we make suppositions?. 4.-Perhaps the only explanation as how top GMs are able to play is that of “I simply saw it”?. 5.- Maybe books contain too many “because’s” but very few “how’s” ?. (This position is from the 7th game of the Baguio match. (W.: Korchnoi). Apparently Black’s position seems much better and some GMs present thought Karpov was winning. They were suddenly awoken when after Korchnoi’s sealed move was made: 42. Qh8 a draw was immediately declared. Both camps had made their homework and though the analysis contains some complicated lines, it shows there is no way of winning. At least, that was the conclusion. 1. e4 , e5 /2. Nf3 , Nc6 /3. Bb5 , a6 /4. Ba4 , Nf6 /5. 0-0 , Nxe4 / 6. d4 , b5 / 7. Bb3, d5 / 8. de5 , Be6 /9. Nbd2 , Nc5 / 10. c3 , d4 / 11. Ng5 !!?. Korchnoi found his way through the complications and the game ended in a draw in 44 moves. Have the reader ever felt the pains I have here exposed?. It’s a real nightmare. This is why , from time to time, one gets the odd feeling that one knows nothing at all of Chess. How can it be possible and continue living???? Baguio 1978. World Championship Match. 1.e4, e5 / 2. Nf3 Nc6 / 3. Bb5 ,a6 / 4. Ba4 , Nf6 /5. 0-0 , Nxe4 /6. d4 , b5 / 7. Bb3 , d5 / 8. de5 , Be6 /9. c3 , Bc5 / 10. Nbd2 , 0-0 / 11. Bc2 , Bf5 / 12. Nb3 , Bg4 / 13. h3 , Bh4 / 14. g4 , Bg6 / 15. Bxe4 , de4 /16. Nxc5 , ef3/ 17. Bf4, Qxd1 / 18. Raxd1 , Nd8! /19. Rd7, Ne6 /20. Nxe6, fe6/ 21. Be3 Rac8 /22. Rfd1 , Be4 /23. Bc5 , Rfe8/ 24. R7d4, Bd5?! /25. b3 , a5 /26. Kh2, Ra8 / 27. Kg3, Ra6? 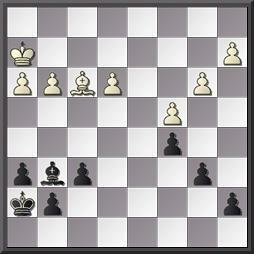 (27…Bc6 -Larsen) / 28. h4, Rc6 ( according to Larsen, the decisive mistake) /29. Rxd5!, ed5/ 30. Rxd5, Rce6 / 31. Bd4, c6 /32. Rc5, Rf8/ 33. a4!, ba4 / 34. ba4, g6 / 35. Rxa5, R6e8/ 36. Ra7, Rf7 / 37. Ra6!, Rc7 / 38. Bc5, R7f8 / 39. Bd6, Ra8 / 40. Rxc6, Rxa4 / 41. Kxf3, h5/ (Adjourned) 42. gh5 , gh5 / 43. c4, Ra7 / 44. Rb6, Kf7 / 45. c5, Ra4/ 46. c6, Ke6/ 47. c7, Kd7/ 48. Rb8, Rc8/ 49. Ke3 , Rxh4/ 50. e6! and Korchnoi resigned. 41. Rh6, Kf7/ 42. Rh7, Kf8 / 43. Rh8, Kf7 / 44. Bd2,Nf8/ 45. Rh1, Kg6/ 46. Rd1, f5 (Defending actively. Larsen believes this is a conceptual mistake and advocates a passive defence) 47.Nf2, Bd6 / 48. Bc3, Nd7 /49. gf5, ef5/ 50. g4!, Nb6/ 51. Kf3, Be7/ 52. Ba5, Rf6/ 53. Kg2, fg4 / 54. Nxf4, Re6/ 55. Kf3, Bf6 / 56. Nxf6, Rxf6 / 57. Kg4!, Nc8 / 58. Bd8!, Tf4 / 59. Kg3, Rf5 / 60. a4, Kf7 / 61. Rd3, Re5 /62. Kg4, Kg6 /63. a5, Re4 / 64. Kf3, Tf4 / 65. Ke3, Rh4/ 66. Rd5, Rh3 / 67. Kd2!, Rxb3/ 68. Rxc5, Rb8/ 69. Rc6, Kf5 / 70. Rxa6, g4/ 71. Rf6, Ke4/ 72. Bc7!, Rb2/ 73. Kc3, Rb7/ 74. Bh2, Rh7/ 75. Bb8, Rb7/ 76. Bg3, Rb1/ 77. Rf4!, Ke3/ 78. Rf8, Ne7 / 79. a6 and Karpov resigned. If you think about Korchnoi’s career you see his heyday (a long one, by the way),coincided with the golden age of the Soviet Chess. Thus, in the fifties and sixties (20th century), he had to battle against players like Smyslov, Keres, Geller, Tal, Stein, Bronstein … And when he started his World Championship path (1962) Petrosian was on top, and then Spassky. He was unable to overcome such a formidable opposition. In the late sixties and the seventies, it was first Fischer and then Karpov. He seemed to be always in the middle of a whirlwind. His character and behaviour did not help either and in 1974 Karpov, the young star, was “preferred” by the Soviet Chess authorities so as to try to recover the title in Fischer’s hands. Some of his fellow-colleagues in the USSR said he was always complaining about something, always blaming others, etc. The human condition… During the last years he also created some problems in the tournaments when he railed against some much younger players who protracted games looking for a mistake on his part, or for not resigning when he considered it was high time, and so on. This has gained him some animadversion of late. Evidently he belongs to a different generation though he still wants to win above all!. I met Korchnoi in 1994. I was at a tournament hall waiting for him to appear , with a book with his games, hoping he would be so kind of signing it to me. He arrived and immediately notice my presence (we have never seen one another before and as happen with Karpov or Spassky I had been waiting too many years to see one of my early heroes). I asked him to please sign the book and he did it. Then he looked at me tried to ask some sort of question ,I tried to help but suddenly he realized where he was and hurried towards the playing room!. I never had another opportunity to meet him. Today he , at 81, keeps on playing as the Nestor of the chessboard. He is an example of will-power and love for Chess. 1.c4 Nf6 2. Nc3 e6 3. Nf3 d5 4. d4 c6 5. e3 Nbd7 6. Bd3 dc4 7. Bc4: b5 8. Bd3 Bb7 9. 0-0 b4 10. 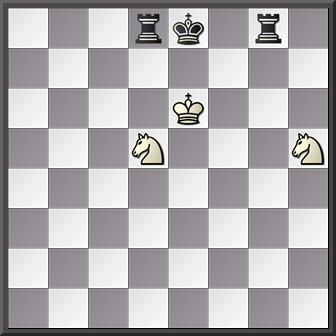 Ne4 Be7 1.Nf6: Nf6: 12. e4 0-0 13. Qc2 h6 14. Be3 Rc8 15. Rfd1 c5 16. dc5 Ng4 17. Bd4 e5 18. h3 ed4 19. hg4 Rc5: 20. Qd2 a5 21. Rac1 Qd7 22. Rc5: Bc5: 23. g5! hg5 24. Qg5 Qe7 25. Qh5 g6 26. Qh6 Qf6 27. Bc4 d3 28. e5 Qf5 29. Rd3: Be4 30. Rd6 Qg4 31. Rf6 Bf5 32. b3 Bd4 33. Nd4: Qd4: 34. Rg6: Bg6: 35. Qg6: Kh8 36. Qh6 Kg8 37. e6 Qe4 38. ef7: Rf7: 39. Qf6 Qb1 40. Kh2 Qh7 41. Kg3 Qd3 42. f3 Qc4: 43. Qd8! Black resigned. 1. c4 e6 2. g3 d5 3. Bg2 Nf6 4. Nf3 Be7 5. d4 0-0 6. Nbd2 c6 7. 0-0 b5 8. c5 Ne4 9. Ne5 f6 10. Nd3 f5 11. Nf3 Bd7 12. Nfe5 Be8 13. a4 a5 14. f3 Ng5 15. g4 b4 16.Kh1 Bf6 17.Be3 Ra7 18.Rg1 Kh8 19. Qe1 Nf7 20. gf5: ef5: 21. Bh3 Ne5: 22. de5:! Bh4 23. Qd2 Na6 24. Nf4 Nc7 25. Qd3 Qc8 26. Qd4! Qd8 27. Rad1 Bd7 28. Rg7!! Kg7: 29. e6 Bf6 30. Rg1 Kh8 31. ed7:! Qd7: 32.Nh5 Ne8 33. Nf6: Nf6: 34. Bh6 Rf7 35. Bf4 Qe6 36. Be5 Ra8 37. Rg5 Rg8 38. Rf5: and Black resigned. 1. c4 e5 2. g3 Nc6 3. Nc3 g6 4. Bg2 Bg7 5. Rb1 f5 6. d3 Nf6 7. e3 0-0 8. Nge2 d6 9. b4 a6 10.a4 a5 11.b5 Ne7 12. Ba3 Rf7 13. Qd2 c6 14. d4 e4 15. h4 Be6 16. d5 cd5: 17. Nf4 Qc8! 18. cd5: Nfd5: 19. Nd5: Nd5: 20. Rc1 Bc3 21. Rc3: Nc3: 22. 0-0 Na4: 23. Rc1 Qd7 24. Bf1 Rc8 25. Rc8: Qc8: 26. Qd6: Bb3 27. Qe5 Qd8 28.b6 Qb6: 29.Bb5 Qf6 30. Qe8: Kg7 31. Kg2 Nb6 32. Bc5 Kh6 33. Bd4 Qd6 34. Nh3 Rf8 35.Be5 Re8: 36. Bd6: Rc8 37. 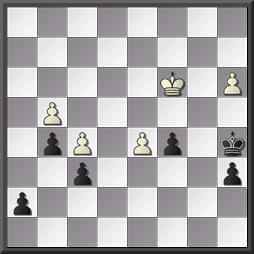 Ng5 Kg7 38.g4 a4 / and Black lost on time in a desperate position. My feelings towards Botvinnik are , today in 2012, contradictory. Some 30 years ago Botvinnik’s games taught me the art of planning in Chess. You may know strategy, you may be able to play combinations, calculate variations, etc. But one day you realize you are not progressing… That happened to me: I could understand any positional game, no matter if that was played by Petrosian or Karpov. And?. And you have to learn how to make plans and integrate them in the framework of a chessgame. I even discovered , on my own, that planning was not only referred to “strategical planning”, and realized there was also “tactical planning” : I called it “tactical strategy” . Botvinnik learnt Chess at 12, and became a GM in 1950. Champion of the Soviet Union in seven times. In 1948 a match-tournament was decided as the way to find the Chess World Champion. Alekhine had died two years before and the old method of choosing a challenger died with him as FIDE took over the ruling of the Chess world. The “chosen few” were Botvinnik, Smyslov, Keres, Reshevsky, Fine and Euwe. 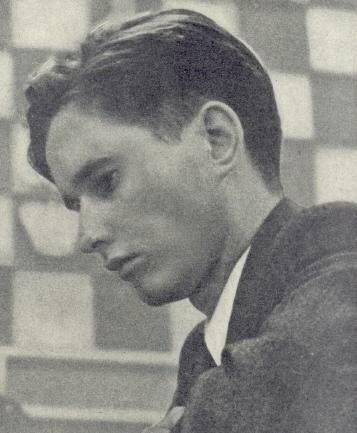 Reuben Fine declined to take part and when the smoke of the battle cleared Botvinnik had won the event. In 1957, Smyslov defeated him becoming Champion of the World. For cases like this , Botvinnik had secured a return match in a year’s time. In 1958 he regained the title. In 1960 Tal beat him but in 1961, again in a return match, Botvinnik defeated his opponent… Again World Champion. In 1963 Petrosian defeated him this time with no return match. It was said that Bovinnik never forgave FIDE for such a “treason”. Botvinnik had to learn to live -as the rest of the USSR citizens- in the terrible Stalinist era. Apparently he knew how to do it. He was the Chess “blue-eyed-boy” of the regime, and he knew how to move his pieces on the political board too. Not only in the Keres’ controversy, but also when he feared he could not be taken as the best to play against Alekhine… Apart from Stalin himself – remember Chess was a “matter of state” in the former USSR, it seemed he was in good relations with names like V. Snegirov, Nikolai Krylenko (1885-1938), People’s Commissar of Justice and Prosecutor General of the RSSFR and, in the 30’s, also head of several sports associations,with Chess among them. The last was V. Molotov (1890-1986): Stalin’s protegee, Chairman of the Council of People’s Commissars, Minister of Foreign Affairs, First Deputy Premier. Many pages have been written about all this. I have my own opinion, of course… But curiously enough, all his political influences could not prevent him from being excluded of the Soviet Union Chess Team for the Helsinki Chess Olympiad. Botvinnik explained that was due to two bad results (The Maroczy Memorial and the USSR Chess Championship) but he was far from pleased since he wrote that the decision was taken in a “strange way” by voting it among the rest of Team members : Bronstein, Keres, Smyslov, Boleslavsky and Geller (remember what had happened with Keres before, and later with Bronstein…) The result of the “poll” was unanimously against him with a blank ballot (!) .-So he would never know who to really blame for the offence!-. Botvinnik had a natural talent for strategy and planning. He tried to find an “opponent-proof” opening repertoire focusing on the English/ Catalan/ QG as White and the French as Black . Against the QP he used several defences within QGD boundaries but also the Grünfeld though one of his pet lines was the Dutch. He made a great contribution to the theory of the middlegame systematizing many positions and procedures. – Is the Bronstein story true? -What happened in the Keres case? The same I said in the post about Keres (nº. 2) I believe happened -if it really happened- with Bronstein. The Soviet authorities had many ways to do things. They did not bother to kill Petrov as you know. In the Keres case, he knew what he had to do to survive and did it. In the Bronstein case I suppose the adequate hints operated the miracle. But we will never knew the truth. In the case of chessplayers nobody can explain why some suffered such criminal treatment while others could speak even criticize openly without too many problems. 1.- Copy a Botvinnik game in a sheet of paper in columns. 2.- Play the first ten-twelve moves on the board. 3.- Cover Botvinnik’s moves with a paper and try to find them one by one. Once you ave cosen your move (the move you think Botvinnik played, uncover it and check it against he move you chose. 4.- Once you have finished the exercise, replay the game writing down why you thik Botvinnik played each move. -take the total number of moves of the game. -take down the number of opening moves you played. -add two zeroes to the number of moves you have guessed. -divide this number by the number you got in step two. For instance: let’s suppose the total number of moves was 40. You played ten opening moves. So, 40 -10 = 30. A percentage 0f 70% or + is excellent. This is the way I used to train. P.S. The blog has been flooded by spam comments so from now on it will be necessary to register to leave a comment. I hope you understand this decision and encourage you to leave comments. Thank you very much indeed..- Questchess. The Soviet Chess School.Part 2. The Soviet Chess School did not appear out of nothing. Chess had been playing in Russia for centuries and during the 19th century the seeds of what later became an immense machinery began to appear. The concept of “Russian Chess School” appeared in that century too. We must bear into our minds that America had its Morphy, and in Europe names like Steinitz, Tarrasch Staunton, Lasker and many others began to appear too. Soviet Chess historians/players mention , at least, the following names: Alexander Petrov (1794- 1867), Sergei Urusov (1827-1897), Emanuel Schiffers (1850-1904), Karl Jaenisch (1813-1843) and, above all,the considered “Father of the Russian Chess” Mijail Chigorin (1850-1808). You will recognise the names in different “modern” openings. The first Chess magazine in Russian was “Shakhmatny Listok” (1859). Chigorin developed as a chessplayer when Steinitz’s theories were being developed by Tarrasch, and he disagreed with many of the postulates, developing a new approach to Chess, livelier, more dynamic. His concepts are still valid today and were the basis for the new approach of the Soviet Chess School,always focusing everything on dynamics. This was the first attempt at reaction against the static views advocated by Tarrasch.Chigorin understood that tactical operations should not be a goal in themselves but rather a part of the positional phase of the fight over the board, and he also criticised the idea that “natural moves” were the best. He insisted upon concrete analysis as the main guideline even from the very opening (consider for instance his 1. e4 e6 2. Qe2 against the French). A curiosity is that he preferred Knights to Bishops (the eternal discussion…) and advocated the defence which bears his name: the Chigorin Defence against the QP : 1. d4 Nf6 2. c4 Nc6 . But the reader will probably remember him for the famous Chigorin System against the Ruy Lopez /Spanish. 1. e4 e5 2. Nf3 Nc6 3. Bc4 Nf6 4. Ng5 d5 5. ed5: Na5 6. Bb5 c6 7. dc6: bc6: 8. Be2 h6 9. Nh3 Bc5 10. d3 0-0 11. Nc3 Nd5 12. Na4 Bd6 13. Ng1 f5 14. c3 Bd7 15. d4 e4 16. c4 Ne7! 17. Nc3 Be6 18. b3?! Bb4 19. Bb2 f4 20. Qc2 Qd4: 21. Kf1 f3! 22. gf3: ef3! 23. Bf3: Bf5 24. Ne4 Be4:! 25. Qe2 Bf3:! 26. Qe6 Kh7 27. Bd4: Bh1 28. Qh3 Nf5 29. Be5 Rae8 30. Bf4 Nd4 31. Qd3! Be4 32. Qd4: Be4 33. f3 Ref8 34. Qa7: c5 35. Qc7 Nc6! 36. a3 Rf3:! 37. Nf3: Rf3: 38. Kg1 Bd2! .White resigns. 1. d4 Nf6 2. c4 e6 3. Nc3 Bb4 4. Qc2 d5 5. a3 Bc3: 6. Qc3: Ne4 7. Qc2 c5 8. dc5: Nc6 9.e3 Qa5 10. Bd2 Qc5: 11. b4 Qe7 12. Bc1 a5 13. b5 Ne5 14. Bb2 Ng4 15. Nh3 Qh4 16. g3 Qh6 17. Qe2 Ngf6 18. Nf4 0-0 19. Bg2 dc4: 20. Qc4 Nd6 21. Qd3 Rd8 22. Rd1 Nfe8 23. 0-0 a4 24. Ne2 Bd7 25. Nc3 Ra5 26. Qd4 Qg5 27. Qb4 b6 28. Rd2 Bb5: 29. Rfd1 h6 and Black resigned.